I believe ridesharing is a great way to get around town without spending a fortune. Aside from public transportation, my husband and I use ridesharing options when we need to get somewhere and don’t want to drive. If you have a newer car and need a flexible schedule, you might be able to take advantage of those by driving for Lyft and make extra money. Working as a Lyft driver in the growing ridesharing space is a great way to make money on the side without needing specialized skills. Lyft is a popular ridesharing option and many often wonder how much can you make driving for Lyft. If you’re looking for a flexible side hustle and are considering driving for Lyft but find yourself asking “How much can I make driving for Lyft”, this post will get you started (and help you earn a $250 sign-on bonus). What are the lyft driver requirements? Potential drivers must also pass a background check. In New York City, for example, DMV and criminal background checks are conducted by the Taxi and Limousine Commission (TLC) according to their licensing standard. Basically, your car must be in good operating order before you can drive for Lyft. As mentioned, the age requirement for your car depends on where you live. For example, the nearest metropolitan city near me is Chicago and Lyft requires your car to be a year 2006 or newer in order to drive. You’ll need to take your vehicle in for an inspection to be approved to drive. Lyft has several inspections locations all over so when you apply, they will locate the closest one to you. Finally, you must be able to use the Lyft smartphone app. It’s pretty easy to make money driving for Lyft. Once you complete your application and get approved, you simply download the Lyft app, sign in, and turn on your notifications to receive ride requests. Additionally, you can currently earn a $250 sign-on bonus when you start driving for Lyft! Lyft will show you ride requests closest to your current location and you can choose to accept or deny them. It’s best to accept as many ride requests Lyft sends you when you’re online to build a high approval rating. Typically, you’ll see the passenger’s name and their current location when you accept a trip so you can pick them up. You get paid based on the distance of the trip and can earn extra with prime time rates if you’re picking up during rush hour. The more trips you accept, the more money you can make driving for Lyft. According to a survey conducted by Earnest, Lyft drivers earn an average of nearly $400 per month. It’s important to remember that can fluctuate based on when and how much you drive. The great thing about Lyft is that the app collects the payment from the passenger so you don’t have to deal with any transactions. You receive payment weekly, based on a Monday through Sunday “work week”. Your payment is based on an accumulation of the previous week’s ride earnings, including tips. 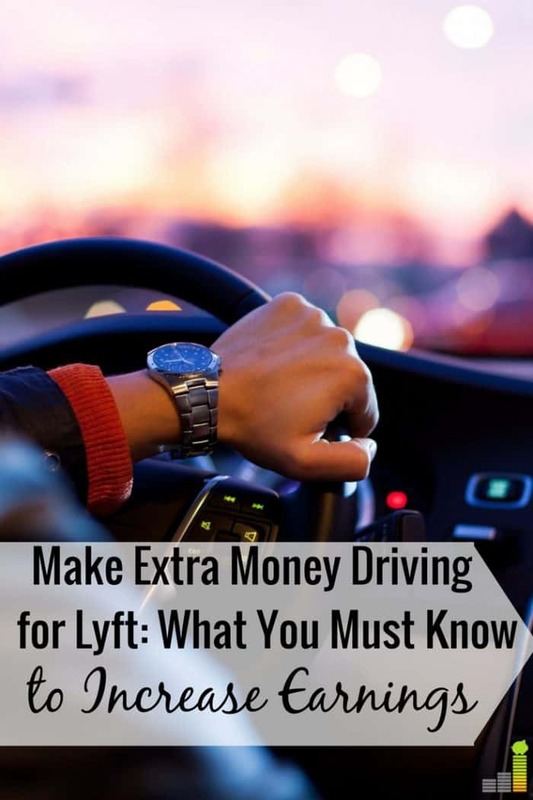 However, Lyft takes a small cut of your earnings, so your earnings might be slightly less than you expect. To receive payment, which is done via direct deposit, you must have an ACH transfer-compatible checking account. When driving for Lyft, you will have some added expenses. For instance, your insurance rates may go up. You may want to increase your coverage on your own just to be safe. You’ll also have to cover gas and tolls since Lyft does not provide a stipend for this. Also, your car may experience more wear and tear depending on how often you drive it. Properly maintaining your car is a requirement to drive for Lyft so make sure to budget for extra fees like repairs and maintenance. When you make money driving for Lyft, you earn money as a contractor/sole proprietor. Therefore, you will have to pay taxes on your earnings. If you make over $400 for the year, you’ll be subject to self-employment tax. It’s best to set aside a portion of your earnings each time you get paid for Lyft so you can pay quarterly estimated taxes. I suggest talking to your CPA or a tax professional to discuss how much you should be saving each month. Make sure to track your mileage, the gas used to fuel your car while driving, toll money spent, and maintenance and repair costs. You can deduct a portion of all these expenses when you file taxes. You can use an app called Hudlr to help you track these expenses throughout the year. Make sure to balance your needs along with the above before pursuing a job with Lyft. Accept as many trips as you can. The more trips you accept, the more dependable you look to Lyft. In return, they will send you more ride requests whenever you’re online. You may end up in nearby towns or places that are 40 minutes away but it’s important to be flexible when you’re driving. You’ll get more trips and earn more money driving for Lyft. Provide good customer service. It’s important to make sure your customers have a pleasant experience in your car. Engage in light conversation if they are willing. Offer extra comforts like adjusting the temperature or charging their phone. You can even provide bottles of water. Also, keep your car extra neat. Doing this can increase your driver rating and will make passengers more willing to tip you. Drive during peak hours and go for incentives. If you’re okay driving during peak hours, you can earn more money since Lyft charges passengers more at those times. Also, take advantage of any incentives Lyft may offer you such as completing a certain number of trips during a span of a few days or driving during specific hours. Using this advice, it’s not difficult to figure out how to make money driving for Lyft. A lot of it comes down to providing good service and being flexible. If you’re able to do both you can make good money driving for Lyft. What are some unique ways you’ve tried to make extra money? Would you ever consider driving for Lyft to make extra money? What do you do with extra money you earn on the side? The post How Much Money Can You Make Driving For Lyft? appeared first on Frugal Rules.